The ambitious Perth Food and Drink Park project has more than whetted the appetite of a variety of press titles, with the story achieving phenomenal coverage across national and regional news titles and focused multi-industry trade press. Perth Food and Drink Park has been specifically designed to create a hub for all the aspects of the food and drink industry in Scotland to thrive, and is aimed to attract inward investment, as well as expansion opportunities for existing and start-up businesses with a £5m investment by Perth and Kinross Council. The news about this ground-breaking initiative had a successful regional and national coverage during the month of February and March. The story has graced the pages of Scotland’s most esteemed titles; The Courier, The National, The Herald and The Scotsman, with them all featuring aerial images of the Perth site. 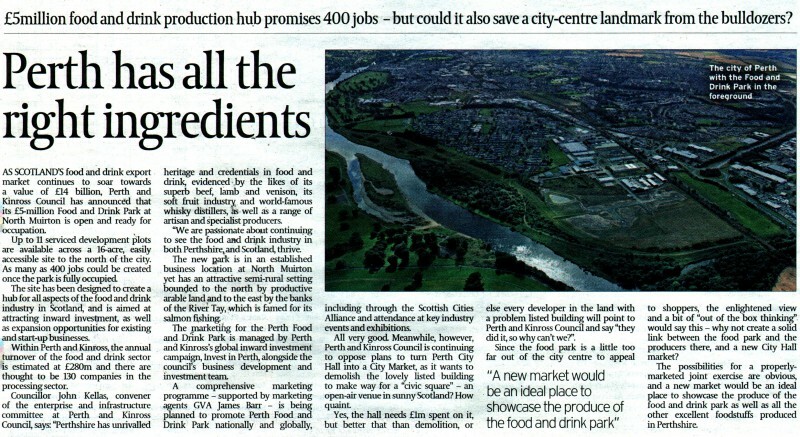 Food and drink is one of Scotland’s key growth sectors with ambitions to grow from £13.1Bn today to £16.5Bn by 2017, helping a project like Perth Food and Drink Park inspire the media with its unique and ambitious proposition. Invest in Perth, the investment agency of Perth & Kinross Council, thanks to the award-winning Food and Drink PR services at Holyrood Parternship hit also many headlines of a variety of important food and drink media across industres, including Food Manufacture , Scotland Food and Drink, Fish News Eu, Malt Marketing, World Fishing and many others. 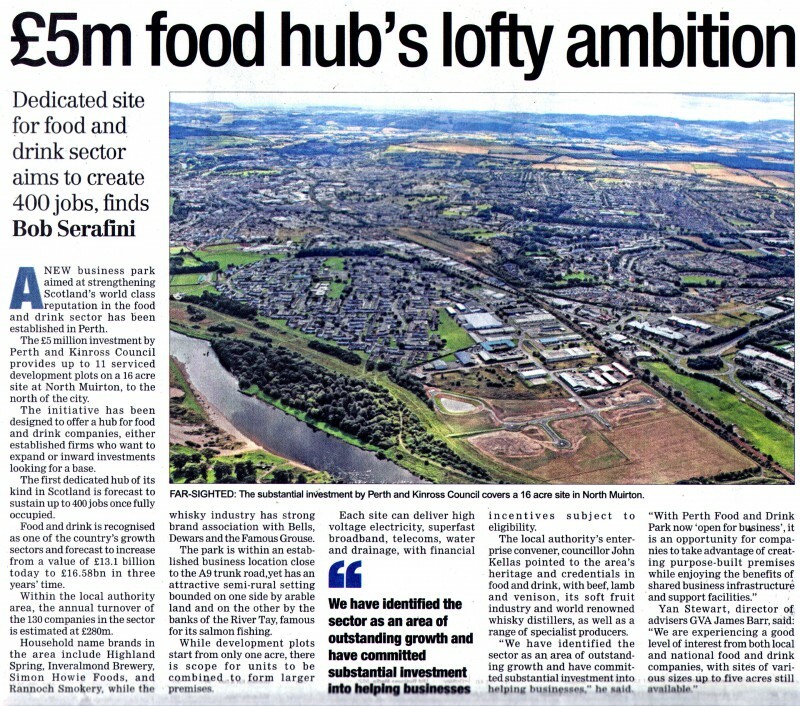 This interest from the media shows how the Perth Food and Drink Park has been seen as a key project that will boost the economy of the area and improve such an important business sector for Scotland. Everything about the project is focused on serving the industry, with the Perth Food and Drink Park located strategically close to the A9 trunk road, with good links to Perth city centre and train station, and only a 45 minute drive from Edinburgh International Airport. This latest media triumph for our client reflects the ongoing work from the award-winning team at the agency and their dedication to telling the stories that are at the heart of every business.